In this work, we will present a novel approach for the detection of small molecules with molecularly imprinted polymer (MIP)-type receptors. This heat-transfer method (HTM) is based on the change in heat-transfer resistance imposed upon binding of target molecules to the MIP nanocavities. Simultaneously with that technique, the impedance is measured to validate the results. For proof-of-principle purposes, aluminum electrodes are functionalized with MIP particles, and l-nicotine measurements are performed in phosphate-buffered saline solutions. To determine if this could be extended to other templates, histamine and serotonin samples in buffer solutions are also studied. The developed sensor platform is proven to be specific for a variety of target molecules, which is in agreement with impedance spectroscopy reference tests. 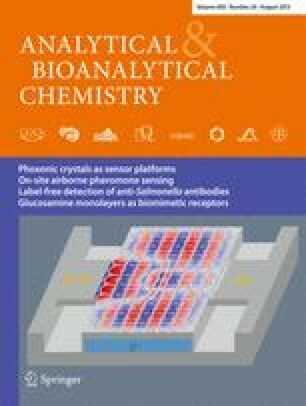 In addition, detection limits in the nanomolar range could be achieved, which is well within the physiologically relevant concentration regime. These limits are comparable to impedance spectroscopy, which is considered one of the state-of-the-art techniques for the analysis of small molecules with MIPs. As a first demonstration of the applicability in biological samples, measurements are performed on saliva samples spiked with l-nicotine. In summary, the combination of MIPs with HTM as a novel readout technique enables fast and low-cost measurements in buffer solutions with the possibility of extending to biological samples. This work is supported by the Life-Science Initiative of the Province of Limburg (M. Peeters) and by the Internationalization Program of Universidade de São Paulo, Brazil (P. Csipai). The authors also would like to thank A. Gaulke and P. Losada-Pérez for stimulating scientific discussions and H. Penxten, J. Soogen, C. Willems, and J. Baccus for technical assistance.